I recently bought two old albums of postcards, one of which includes a real photo postcard of Lower Beaver Falls on Beaver Creek. There must be a lot of Beaver Falls on a Beaver Creek, but this one is identifiable. How many times have we been down Highway 30 toward Astoria, and passed the townlets of Alston and Delena, and the turnoff to Beaver Falls Road? Many times. This time we took the turnoff. 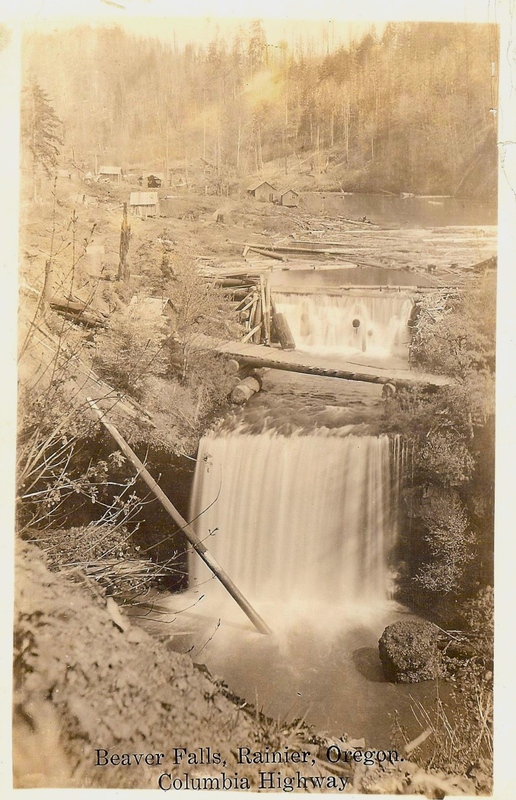 Here’s that postcard view of Lower Beaver Falls, taken about 1920. Just above it is a primitive plank road crossing, and a splash dam, built to impound the creek. Why? To collect logs, then to pull the dam and send the logs roaring down the creek to a mill somewhere below—probably where Beaver Creek enters the Columbia at the townlet of Inglis. Here’s Lower Beaver Falls today, reached by a muddy but easy trail from the road—which road, once upon a time, was the main Columbia River Highway to Astoria. Things looked different today.